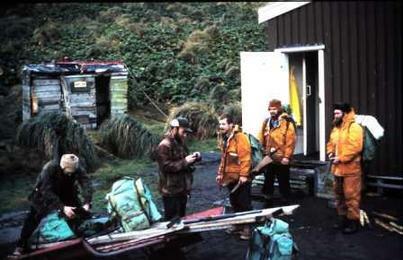 ​The picture at Bauer Bay shows a group of expeditioners who took down supplies to Bauer Bay (including 44 gallon drum of fuel) on the Gnat because "Nella Dan" was unable to land any supplies at Bauer Bay that year due to heavy seas. We don't know the identity of the fellow bending over the Gnat. Standing in the middle with a peaked cap is Peter Ormay, then John Evans ("Doc"), Richard Schmidt ("Dicko") and unidentified man on the extreme right (can't decide between two of the blokes there that year). Scruffy says it was extremely difficult to get the Gnat up onto the Plateau, let alone the 44 of fuel! I notice that two of the fellows are armed, but of course they for catching bunnies for dinner. Is anyone able to advise the identity of the men at the extreme left and right of the photo? Also are there more pictures /information on the gnat?